There is no Santa Claus, There is no “6 weeks to a Bikini body”! ……we are in this for health…..a health centric lifestyle that will eliminate those pressures and frustrations of the usual fitness paradigm. We were “naturally selected” for a very different lifestyle than we have today. Our sedentary lifestyles are only about the last 50 years – which is not even a notch on the evolutionary time line. Even if we think we are active because we run 3 times a week, or go to the gym 5 times a week – by evolutionary standards – that still does not meet the criteria of activity. Activity is a measure of circulation and oxygen consumption by the body, all day. Here is what happens when we lose weight fast: first of all let’s remember if we are talking losing weight – we are usually referring to a number on the scale – which is a poor measure of fat loss. The scale does not tell us if we lost fat, muscle, water or any other precious bodily resources.We need to hone our wish list to fat loss – in other words design our weight loss program around scientific methods of fat loss, and saving our muscle mass. And yes, it is both an art and science to lose fat and save muscle. Our muscles are what keeps us lean and fit, over the long haul. The reason many people feel they gain weight uncontrollably as they age is because of a nasty fact of life called sarcopenia: that is the fancy scientific term for use it or lose it. If we don’t nurture our muscle mass with proper nutrition and physical activity and exercise (please note I mention both physical activity and exercise – they are NOT the same), then we sacrifice our muscles and bones. Sarcopenia is NOT a doomed destiny – it is very possible to steer clear and keep our muscle tone and bone density- but fad gimmick diets, starvation, lose weight quick schemes all lead to the breakdown of muscle. Muscle is an absolute necessity for fat burning, staying fit, disease prevention,our immune function…..our muscle mass is absolutely our BFF in life. 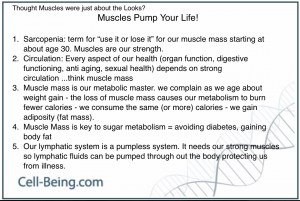 Losing muscle mass is the sure way to gain weight and create metabolic disasters….which lead to further weight gain. cell just shrinking and not going away permanently was another Ace in the evolutionary winning hand of natural selection. Quick weight loss programs, due to metabolic and hormonal issues leave the fat cells looking to grow and multiply. This is another reason for the “yo yo” effect – known correctly as weight cycling – the fat cells at time of rapid weight loss are looking to fortify and multiply to protect against the perceived invasion of starvation. Obesogens and Endocrine Disruptors: Feel sabotaged? Especially as we age, there are more and more saboteurs to our health and fitness goals. 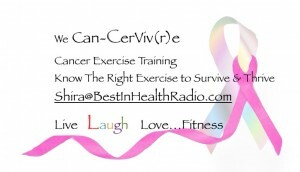 Our Best in Health Radio health coaching goes far beyond…. 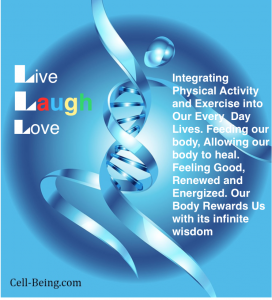 right down to cell health……. We are blessed to have the public healthcare system we do. Nobody goes without healthcare. However, the downside is, we have been programmed as to our system is “healthcare”, when in fact it is sick care. The vast majority of our “Health care” is a trip to the doctor when we are sick. Our body is the most delicate, beautiful ecosystem of all. Unfortunately we get bombarded daily by carcinogens, mutagens, pathogens, toxins, chemicals & medications, viruses and bacteria. Our health is dependent on our inner ecosystem to achieve homeostasis once again, taming the cacophony back into symphonic bliss. Making good sound lifestyle choices is a great start. Equip the body to fight unwanted intruders: Exercise, Physical activity, nutrition, sound choices to avoid exposure to pathogens…a really great start. However, we unknowingly are bombarded with disturbances, and we need help getting our body back in balance and homeostasis. Balance: Exercise can also be a form of oxidative stress – running down our inner ecosystem. Exercise for disease recovery, and go forward, is different. It is NOT just about “taking it easier” – we can have all of the same great fitness goals – we just take a different path to get there. Our Health Processes Integrate far more than a restrictive diet and rigid exercise prescription. Lets make it fun, embraceable, empowering…and all about YOU and Your needs!